JORHAT.NOV.30: Homoeopathic Medical Association of India in Association with Govt. 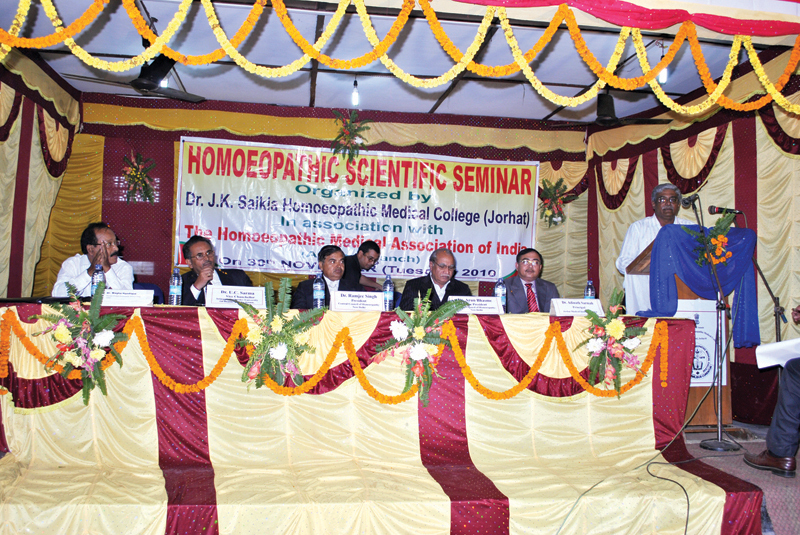 J.K. Saikia Homoeopathic Medical College organized a seminar at college Auditorium. Dr. Ramjee Singh, president, Central Council for Homoeopathy Inaugurated the seminar by lighting the traditional lamp and garlanding Hahnemann's portrait. Dr.Arun Bhasme, Vice president, Central Council of Homoeopathy, and Dr.U.C. Sharma, Vice Chancellor of Srimanta Sankardev University of Health Sciences, Assam also participated. Dr. S.S. Thakur, Dr. Ajoy Datta, Dr. B. Pegu, Dr. P. Sonowal, Dr. (Mrs.) Kanchan Bala, Dr.(Mrs.) K. Datta, Dr. Dharmeshwar Borah, Dr. S. L. Saikia, and Dr. D. Bhattacharjee participated this seminar. Dr. N.K. Mishra, co ordinated this event and Dr. Narayan Debnath, organizing Secretary,member CCH proposed vote of thanks.